Get ready, because Furby Boom is the beginning of an adventure. A new generation Is hatching on the free Furby Boom app, where you and your Furby Boom can collect digital eggs, hatch them, and raise a city of virtual Furby Furblings. The Furby Boom experience combines real-world interactions with virtual play for a game that will keep you coming back for more. Your Furby Boom responds to you, changes personalities based on how you treat it, dances to your music, speaks Furbish and, more than anything, wants to connect with you! 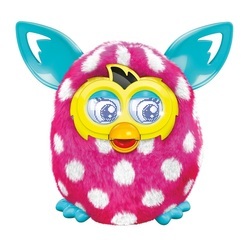 Furby Boom can hatch more than 50 virtual Furby Furblings eggs. Collect virtual eggs in the free Furby Boom app by taking care of your Furby Boom, getting them from friends with Furby Boom, and even by finding them (doh..). As you collect and hatch virtual Furblings eggs, your digital city fills up with virtual Furblings that you and your Furby Boom can interact with. If you hatch enough virtual Furblings to fill the towers of your city, you can get the golden egg. Team up with your Furby Boom and your virtual Furblings to play games in the app such as Furball, the Furbish version of football. When you play with your Furby Boom creature using the free Furby Boom app, you can unlock the complete game experience. Give your Furby Boom a name using the app - your Furby Boom will remember it and the names of other Furby Boom creatures it meets! 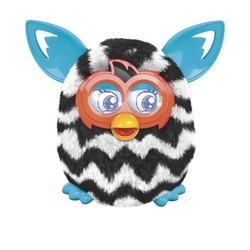 Keep track of your Furby Boom creature's health, hunger and cleanliness levels using the app's monitor. • Time for a checkup? Try X-raying Furby. • Is Furby hungry? Grab a snack from the app's pantry. • Need to freshen up? Give Furby a virtual shower! When you take care of your Furby Boom, it becomes ready to take care of something too -- that's when you get a virtual Furby Furblings egg! The Furby Boom app is available to download from the Apple App Store and Google Play for Android devices, and it's free. For Apple devices, the app requires iOS 4.3 or later, is compatible with iPhone, iPad, and iPod touch, and the app is optimized for iPhone 5. 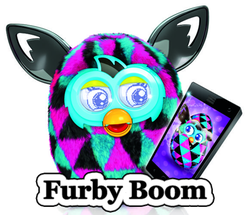 Furby Boom has A Mind of Its Own and combines physical and digital ways to play! Interact with your Furby Boom 1 on 1 to shape its personality. This Furby Boom creature has more than twice as many responses as the previous Furby, and has 5 new personalities to discover. Kah toh-loo oo-nye - Me like you! Wee-tee toh-toh - Singing time! Kah ay-ay oo-nye - Me see you! Kah oo-tye nah-bah - Me upside down! Noo-noo dah doo-ay - Talk big fun! Dah-kah oo-nye - Thank you! Ee-day Ah-tah - Good food! Dah loo-loo - Big joke! Created for children aged 6 and up, Furby Boom is both a physical and digital interactive toy that actually develops its own personality according to the way you play with it. The Furby Boom will remind you of the good Gremlins from the 80's movie of the same name, but these "intelligent" adorable little creatures from Hasbro are the closest thing to a real, live toy/pet your child may have ever experienced. Expanding on the madly popular Furby, the new Furby Boom offers twice as many responses as its cuddly predecessor, can actually "give birth" to multiple offspring, and loves to talk and learn. Furby Boom - What is it? Hasbro calls Furby Boom the "beginning of a new adventure", and that is right on the money. Physically, Furby Boom figures look just like their predecessor, the original Furby. This new generation works in tandem with the Furby Boom app on your smartphone or tablet to collect digital eggs that it then hatches and raises. The real-world interactions are nothing short of amazing, with your particular Furby Boom remembering not only its own name, but also the names of Furby Boom friends that it meets. These intelligent little guys are powered by four AA batteries that you must supply, and that is all you need to have them dancing to music, speaking Furbish and hatching more than 50 virtual Furby Furblings eggs. Your child collects additional eggs every time he or she interacts with the cuddly critter, and can X-ray, feed and even shower their Furby Boom with the special integrated application. Furby Boom replies in its cute little voice, and your child can monitor its health, cleanliness and hunger through the app. If enough virtual Furblings are hatched, your child is able to fill up the towers of the Furbish city and win the golden Furby Boom egg. And the ongoing care and maintenance of both the Furby Boom and virtual Furblings teaches your child responsibility, while also providing a cuddly and caring playmate which will deliver weeks and possibly years of play time enjoyment. Every time the Furby Boom is played with, its personality is shaped and developed, which helps your child understand that her actions have an impact on others. This newest Furby generation is not compatible with prior Furbies, and the integrated app is available through the Google Play store or Apple App Store. This lovable and engaging companion for your child encourages social interaction and care-giving. And the app access is optional, but will make your child's Furby Boom experience more memorable and educational, and you might find yourself interacting with the furry Furby Boom as well.